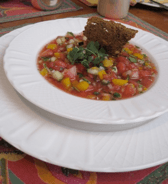 In a large bowl, combine the watermelon puree with the diced vegetables, season, taste. Chill in fridge for at least half an hour. Pour into soup bowls or decorative glass bowls if entertaining, sprinkle with fresh black pepper. Garnish with a sprig of Cilantro. Enjoy!